Sometimes you just aren’t sure what the right gift to get someone is, so you opt for the gift card. Although sometimes seen as a social faux paux, gift cards are also rated very highly as gifts to receive. It is, of course, much easier to shop for yourself than to hope someone else gets it right. There are bunch of different ways you can acquire discounted gift cards. 1. Find used gift card websites. The easiest method is to buy a “used” gift card off of a gift card reseller like Gift Card Rescue, Plastic Jungle, and Card Pool. These companies are like a trading house for gift cards. If you need to sell one, the company will buy it for you around 75% to 90% of the original value. For the seller this isn’t ideal, but it is better than having a gift card to a place you will never use it. You mail in the gift card, the company confirms it is legit and the amount is correct, and then sends you a check. The company then turns around and sells you the gift card at a lower discount. Discounts can be as low as 2.5% for high volume stores like Wal-Mart and as high as 25% for some retailers. 2. Try holiday bonus gift cards. Another simple way to get extra value for your dollars is to buy gift cards during the holidays. 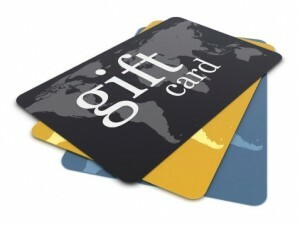 Many restaurants and retailers offer a bonus gift card if you buy a certain amount of gift cards. Common deals revolve around $50 where you might get $10 or $15 in bonus gift cards for purchasing that amount. While not a direct discount on the amount you want to buy, you are still paying less than the total value of the gift cards you are getting. eBay is the world’s biggest garage sale, and yes you can buy gift cards there, too. The discount will depend on the specific individual auction, but in theory you could save money here as well. My only concern is that you are buying something from an individual on eBay rather than through a company. So you might end up with a fraudulent gift card auction. 4. Go through airline, hotel, cash back, and credit card rewards shopping portals. One last way to get a discount is to purchase gift cards through shopping portals of some kind. You can earn airline miles, hotel points, credit card points, or straight cash back depending on which program you buy through. Sometimes gift cards do not count for the portals so be sure to read the terms before making your purchase. In rare cases you can also double dip â€“ buy the gift card through the shopping portal and get points/cash back, then turn around and use the portal again and pay with the gift card to buy something you want, and again earn points or cash back. Do you buy discounted gift cards? Where? Leave a comment!